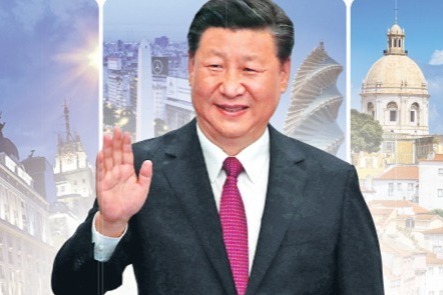 Description：President Xi Jinping's visits to Europe and Latin America have added stability to the global situation and brought positive energy into an anxiety-plagued international community, State Councilor and Foreign Minister Wang Yi said on Thursday in Beijing. President Xi Jinping's visits to Europe and Latin America have added stability to the global situation and brought positive energy into an anxiety-plagued international community, State Councilor and Foreign Minister Wang Yi said on Thursday in Beijing. Xi returned to the capital after wrapping up his overseas trip to Spain, Argentina, Panama and Portugal, which kicked off on Nov 27. In Argentina, Xi also attended the G20 Leaders' Summit, and met with US President Donald Trump and other heads of state. On the overseas tour, Xi supported economic globalization and multilateralism and proactively proposed win-win cooperation, Wang said. During his nine-day itinerary, Xi traveled more than 40,000 kilometers and attended nearly 70 bilateral and multilateral activities. The four host countries all made special arrangements to welcome him, Wang said. While attending the summit in Buenos Aires, the Argentine capital, Xi put forward proposals, promoted cooperation and maintained unity — showing great vision and responsibility as the leader of a major country, Wang said. The proposals Xi made there, including enhancing policy coordination and safeguarding multilateralism, reflected the common desire of all nations and strengthened the G20's status as a primary forum for international economic cooperation, Wang added. In discussing trade issues at the event, Xi said the direction of openness and inclusiveness should be upheld, and nations should adhere to relevant trade rules. Xi said China supports some necessary reforms to the World Trade Organization, but the key is to safeguard the core values and basic principles of the WTO, including openness, inclusiveness and nondiscrimination. During Xi's meeting with Trump, the two leaders interacted in a friendly and candid atmosphere, setting the direction for an outline of how to properly handle current problems in bilateral relations, Wang said. The two presidents agreed to push forward coordinated, cooperative and stable China-US relations, Wang said, adding that the US reaffirmed its stance in support of the one-China policy. The discussion of economic and trade issues was "very positive and constructive", and a consensus was reached by the two sides, Wang said. The meeting steered China and the US in the direction of halting any further escalation of trade frictions, returning to a dialogue track, making win-win cooperation a shared goal and bringing benefits to both global trade and the world economy, Wang said. Facts will prove that China and the US have more common interests than they do disagreements, and they have more reason to cooperate than not to, Wang said, adding that China-US cooperation will not only benefit the people of both sides but also the whole world. During his four-nation trip, Xi reviewed the process of China's reform and opening-up and pledged to provide more opportunities for countries to pursue common development. He stressed that China will host the international import expo every year to open the Chinese market further and to build a free, open, inclusive and orderly global economy with all countries. Wang noted that the other countries congratulated China on its achievements in reform and opening-up, and spoke highly of China's proactive actions deepening market reforms and increasing imports.